Description: Softest shell pink damask is used to create this delightful dress. 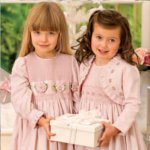 The bodice of the long sleeved dress is smocked in a subtle all-over design, enhanced by the satin ribbon and pretty fabric flowers at the waistline. The sleeves are finished with a frilled cuff and the dress closes at the back with self-cover buttons and a ribbon sash.